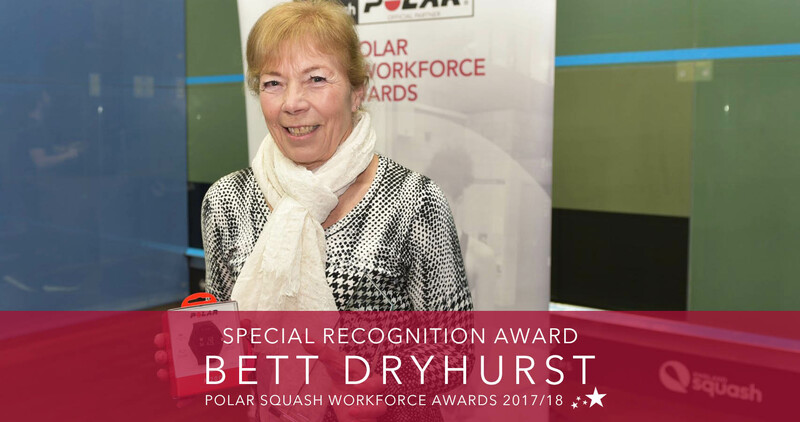 Bromsgrove’s Bett Dryhurst has been awarded with a Special Recognition Award by England Squash for her tireless service to squash, both as a player and for her continued commitment to volunteering. The 72-year-old has for many years been the driving force of Worcestershire Junior Squash, spending her time and energy coaching and encouraging beginners into the sport by promoting squash in local schools and introducing players to local clubs. When Bett found out that she has been nominated for this award she was delighted that someone thought so fondly of her. “I was really quite pleased to have won the award,” said Dryhurst. “I was quite pleased that someone should bother to think of me in that way. It was nice to think that people have recognised me for the work that I have done. “I try to increase participation at our local club and over the years I have been going into schools and also helping to organise our local inter county tournaments. Bett started playing squash when she was 30, representing her local Barnt Green Sports Club and achieving huge success as a masters player. As a key member of the West Midlands volunteer workforce, Bett is frequently involved in running and promoting locally graded events such as the Worcestershire junior inter county teams and England Squash sanctioned events. As well as her volunteer efforts, Bett is an accomplished player, lifting seven British national masters Championship titles and achieving a silver medal in the WO70’s category at the World Squash Masters in Johannesburg. Bett serves as a constant source of encouragement to others, providing support, advice and words of wisdom to all those who meet her as well as helping to inspire the next generation.